On a bright, sunny autumn morning, Rathkeale in west Limerick is an attractive provincial town, with its colourfully-painted shopfronts, their Georgian doorways and their bright window displays. 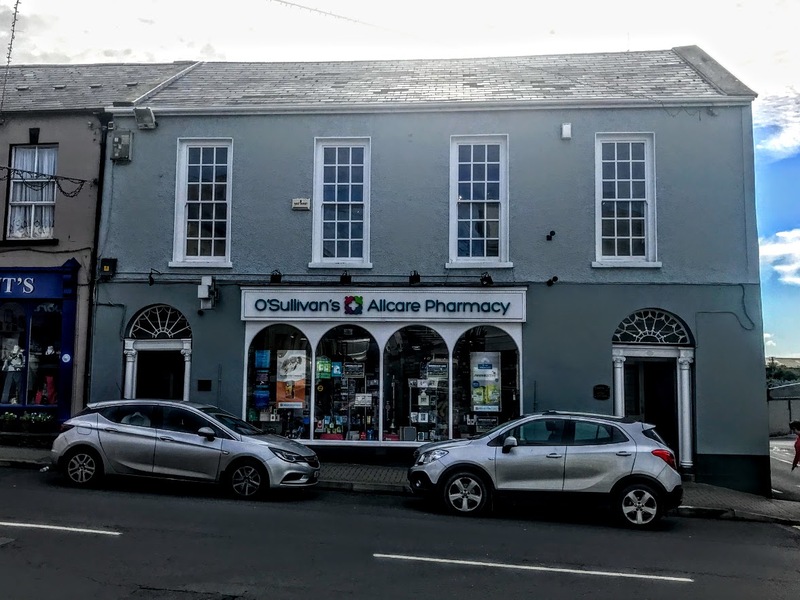 O’Sullivan’s Pharmacy is on a prominent site on Main Street, and the pair of matching front doors at each end of the building serve as an indicator that this four-bay, two-storey premises, now used as a shop and offices, is a former hotel. Today there are two hotels in Rathkeale: the Rathkeale House Hotel and Davy Mann’s Hotel. But in the 19th century Rathkeale had many hotels, including: the Eagle Hotel on Main Street, owned by John B Moylan; the Saint Lawrence Hotel on the Square; the Duke of York Hotel, later the Piggott Arms Hotel on The Square, owned by Charles Hudson, last owned by the Healy family and now demolished; The King’s Arms Hotel, Main Street; Madigan’s Imperial Hotel; and Ward’s Hibernian Hotel. O’Sullivan’s Pharmacy was built as an hotel around 1800, and stood on a prominent site on the Main Street, closing the vista from Thomas Street, which was a main route into the town of Rathkeale, and despite the modern shopfront on the ground floor the building retains much of its early elegance. The shopfront on the ground floor has a square-headed opening with arcaded windows and a fascia above. At each end bay there is a round-headed doorway, with timber panelled doors, cut limestone steps and thresholds, rendered flanking columns with Ionic-style capitals, friezes and cornices and cobweb fanlights. On the first floor, the building has square-headed openings with render surrounds and nine-over-nine pane timber sliding sash windows. These are unusually tall windows and they indicate the early date and use of the building. The rendered walls are roughcast on the first-floor level. Above, there is a pitched slate roof with render copings at the gables. The doorcases and fanlights to the ground floor are further notable features and add artistic interest to the façade of this former hotel. 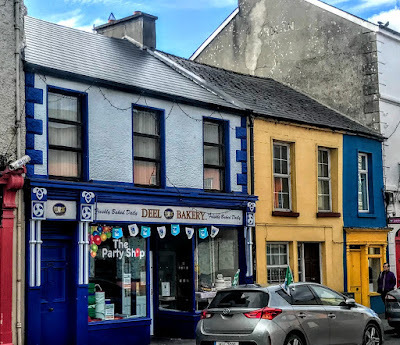 By contrast, the small house a few doors to the east that now serves as a politician’s constituency ‘clinic’ is single-bay, two-storey house, yet it too tells part of the colourful history of 19th century Rathkeale. This small house was built around 1820, and was once used as a shop on ground floor, with family accommodation above on the first floor. 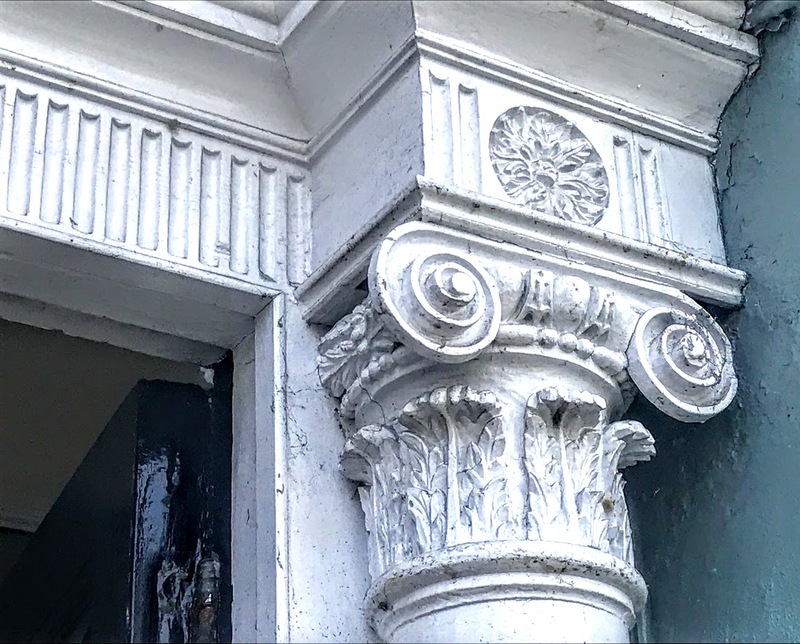 Despite the uPVC window, the shopfront still has timber pilasters flanking the openings, an architrave, fascia and cornice, as well as a timber panelled door with an overlight. 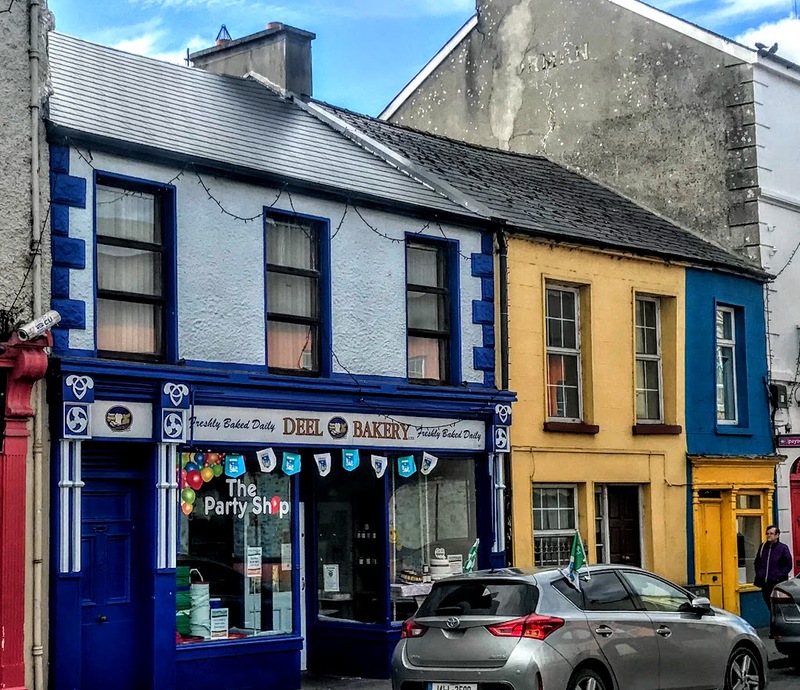 This small building presents an unusual façade and form on the Main Street of Rathkeale, and is an interesting and curious feature to this day, adding to the colour of Rathkeale on a sunny and bright autumn morning.